Our traditional Shrove Tuesday Pancake Supper will be held this year from 5-7pm on March 5th, 2019. We hope lots of St. John’s folks will come and bring some friends to enjoy this pre-Lenten celebration of good food and fellowship. We always need volunteers to help that day with setting up, cooking pancakes and sausages, providing desserts, serving the tables, and cleaning up afterwards. Grateful thanks in advance to our many willing workers. Tickets are $10 for adults and $5 for children under 12. All proceeds will go to our Outreach and Mission projects. For a long time before joining we admired the quaint, historic church building and cemetery of St. John’s. Just walking around the grounds brought about a feeling of serenity, security and attachment to church history and tradition. The first function we attended at the church was the Pancake Supper on Shrove Tuesday. We were strangers to St. John’s but we immediately felt at home as we were warmly welcomed by members of the congregation and minister. After that we started to attend regularly. That was four years ago. The Sunday services, with St. John’s angelic choir and talented organist playing an extraordinary organ, not to mention the thought provoking and uplifting sermons, make church attendance a wonderful highlight for us. The after-service coffee and tea and other St. John’s get together’s tie things together and generate a sense of community. We have also attended group outings to plays and musical events. Generally, churches we have gone to have been quite large and we felt too shy to get involved. The small size of St. John’s has a real advantage over other churches because it provides opportunities for many people to participate in myriad aspects of the church life. We have assisted with church services, been involved in advisory committees and Outreach activities and even worked on maintenance jobs in the building. St. John’s has given us the opportunity to transcend ourselves, to focus our attention on people and things outside of and more important than ourselves. It has been said that it is better to give than to receive and we have both personally discovered the truth in this adage. While we have given of ourselves, we have received back from the church abundantly, in terms of community, fellowship and a heightened sense of personal growth and spirituality. 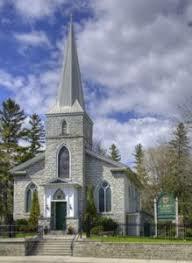 Established in 1841, the Parish of St. John’s is the oldest Anglican parish in the Whitby area. Situated on the north east corner of Brock and Victoria Streets, the church building itself was constructed in 1846 and remains today one of the gems of Port Whitby’s early architecture. Constructed of Kingston limestone, the church is one of two remaining Whitby structures exhibiting this historic material. The building also contains stained glass windows dating back to the early 20th century. The historic cemetery that surrounds the church building is the resting place of many of Whitby’s notable early residents and much history. Although the building and surrounding cemetery carry a great historical legacy, St. John’s is far more than just a place to reconnect with history. As part of the Anglican Diocese of Toronto, St. John’s follows the traditions of the Anglican Church of Canada, gathering every Sunday morning for worship. Offering both a weekly Sunday School during our service and a monthly Messy Church gathering on the fourth Friday evening of each month, we are keenly aware of the need to share the Gospel in new ways with children and adult alike. The church family is composed of people ages 1 to 91 residing from Scarborough to Clarington. Most of them have found a loving family they can be part of, no matter where they come from or how old they might be, and have made it their home for that reason. During the week many can be found volunteering at various places around the region or at the local Tim’s or McDonald’s having coffee together. As our focus changes from looking in to looking out, St. John’s is actively looking to make a difference in our community. New ministries planned in the coming year include Alpha and a monthly Praise and Worship service on Saturday night. We have recently launched a community garden to meet the needs of those living in apartments and condos in South Whitby. If you would like to be involved, call the church. As Port Whitby grows, we too hope to grow and meet the needs of the community around us. Input from the community as to how we can help is always welcome. Whether you come just to see the historic building and cemetery, attend an event, or to break bread with us, you will always be welcome at St. John’s. • Next Sunday will be the final Sunday that we will be taking orders for flower bulbs, if you are interested, please see Janet K.
• There will be an advisory meeting on Sunday April 28th which we will try to keep to 1 hour. Please attend and be a part of what is happening at our Church. Reps from all committees who are required to attend, along with any other Individuals wanting to present information please contact Janet Stephenson ahead of time to be included on the agenda. A Mother's Day lunch will take place after the 10:30am service on May 5th. Tickets are $12. A Tasty, enjoyable way to support our church. Please see Janet if you are willing to sign up and help. • There will be an advisory meeting after the 10:30 service. Everyone in the parish is encouraged to come and discuss the business of the church. Your ideas, opinions, and support is greatly appreciated by the leaders of the church. Fundscript Orders are due on Sunday May 5th. Please return your form and payment to Gail to join in with this great fundraiser. Gas is up, Groceries are always on the to do list, and lets not forget Summer BBQs and birthdays are around the corner!! It is an easy way to give back to the church without spending an extra dime, so please get your gift cards today! We will try to keep the advisory meeting to 1 hour. Please attend and be a part of what is happening at our Church. Reps from all committees who are required to attend, along with any other Individuals wanting to present information please contact Janet Stephenson (stepja2003@yahoo.ca) ahead of time to be included on the agenda. • Fundscript Orders are due today! Please return your form and payment to Gail to join in with this great fundraiser. Gas is up, Groceries are always on the to do list, and lets not forget Summer BBQs and birthdays are around the corner!! It is an easy way to give back to the church without spending an extra dime, so please get your gift cards today! Thank you for everyone who helped out in our Yard sale yesterday. It was an amazing group effort!